If you are into big low-ends and dirty sound, then chances are you’ve heard of Fuzzrocious. The husband and wife team behind this famous, boutique pedal company have been crafting stellar guitar effects at a regular pace since 2010 and haven’t slowed down since. 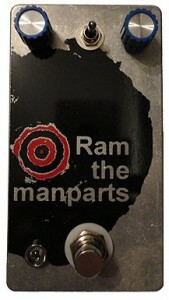 Ryan Ratajski works the electronics, stuffing classic fuzz and distortion sounds that incorporate modern twists into sturdy boxes, uniquely designed and hand painted by Shannon Ratajski. When all is said and done, these boxes stand out both audibly and visibly when incorporated onto your board or line. Hailing from New Jersey, the success of Fuzzrocious is even more impressive when you consider that over the past 4 years, Ryan and Shannon have both worked full-time jobs while raising a family. It’s obvious that Fuzzrocious is more than just a hobby or a second job to these two, it’s a passion. And, when passion mixes with electronics and art, beautiful things happen. Pedal Finder asked Ryan and Shannon to peel some time from their crazy schedule to answer a few questions and they were kind enough to reply. Fuzzrocious is a family affair. Can you talk about how that works and what you all do to stay sane with such a busy schedule? Sanity is a word with a definition that we don’t really know anymore! At the moment, Shannon and I (Ryan) are both still working in education full time and running Fuzzrocious before work, on lunch breaks, and after work into the night. At the end of June 2014, Shannon will no longer be teaching and will focus on Fuzzrocious full time (painting, prepping PCBs, prepping screened boxes for stores, etc. ), so we will be losing her income, but gaining her time and efforts to help the business grow and streamline more. It’s basically trading the frustration of balancing our jobs and Fuzzrocious for less income, but a chance to help us grow the business. Add the kids (now 3 and 6) to this equation and chaos reigns! The best way for us to stay sane is to enjoy the time we get out of the house together to hang with bands/see them play live. It’s our “date night” kind of thing now, since it’s not easy (or economical) to find a babysitter. I love being at home too, so being able to (mostly) work out of the house is a dream for me! Consider this: one pays a mortgage or rent on a house, but how long do you get to use/enjoy said house? Spend more time in it and make your money spent on it worth it. It’s why we don’t have cable tv…why spend so much money on something you don’t get to watch/use for most of the day?! It’s nuts! I read that Shannon has a degree in fine arts. Did she study a specific medium or have a specific interest and how did that translate into the catchy designs adorning all Fuzzrocious pedals? The moment that I learned how to solder and built my first pedal, she asked to paint it. That was “it” for her. Our band dude friends that we shared the designs with supported us/her art from the get-go, so things just rolled from there! Being able to put her thousands of dollars spent on college education to use through the pedals is icing on the cake! 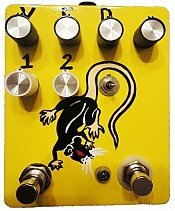 When someone visits the Fuzzrocious shop what do they see? Is there one room where all the magic happens or are there multiple places of production? In my room, you’d see a ton of band equipment that Bethany Murphy and I use in our band, PLUTONIAN, in about half of the room. In the other half, you’d see my workbench with organized parts, pedals in the immediate queue to be soldered, tools, back-stocked parts and boxes, and a ton of screened pedals waiting to be purchased by dealers. In Shannon’s room, she has a large workbench/art desk, light table, paints, cabinets for paints/tools, and a bench with her queue of pedals awaiting paint. Her area is much more focused than mine is for sure! How many years has it been since you modified / crafted your first pedal and what is the number one lesson you learned the hard way. 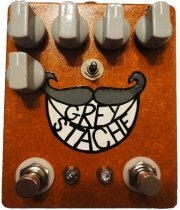 While we say that we’ve been doing Fuzzrocious since 2008, I feel like we didn’t really-really start until we released the Grey Stache, our first pedal, which was around 2010. The biggest scariest lesson I have learned the hard way is (without naming any names of other companies/people) is to never compare your product to another company’s/person’s product. Whether one is paying homage to a design or saying where the building block started from, eventually someone involved with the compared product is not going to like it, so you’re better off not comparing at all! The threat of legal action is enough to induce true panic and fear! We have done an auto wah/envelope filter called the Terrordactyl and a tremolo called The Tremorslo, but have retired both due to crappy sales and customer interest. We have a crazy reverb coming on this year that is a bit different from other reverbs out there. Two outputs, one of which sends oscillation to a second amp/input when the pedal is in bypass (via a footswitch) or a completely wet reverb signal with no original dry note when the pedal is in operation. It’s A LOT of fun and I can already predict that this will be a fun toy for recording in the studio AND live! With hundreds of pedal builds behind you and multiple designs brought to life, what is the hardest part about getting a new design from paper to stage? What’s the most fun? Hardest: finding the time to work on it without killing catch up time on the pedals already bought and in queue. Also, in the prototyping stage, when things don’t work properly from proto build to proto build, it can really be a downer. Mini momentary depression spurts that erupt after I can’t diagnose my problem are enough to make me want to throw in the towel, but I know that if I walk away and come back to the pedal, something will click. Shannon helped me find a way to traverse these hurdles over the years for sure. If it wasn’t for her support and calming nature, I would’ve quit years ago. Fun: watching the pedals sell! After the initial few orders that come in after a pedal is released, there’s usually a lull, which I attribute to people being on the fence about ordering said pedal and waiting to see/hear/read on forums/social media/youtube what people think about it. Once things start moving consistently, it’s a GREAT feeling! If Fuzzrocious was a song – what song would it be? You’re not just a builder, but a bassist and guitarist as well (readers: check out Ryan’s band PLUTONIAN). I know you use other pedals on your board. Are there any pedals or builders in particular that have blown you away recently? The Moog Freqbox has been with me since I was in Cavale a few years ago. It’s a noisemaker/synth machine that performs like no other and while I hate the size of the unit, I love what sounds I can make with it, especially with delay after it. The [sfx] Micro Thumpinator protects my bass speakers from anything below 50 hz. It’s like insurance for your cab! The Malekko B:Assmaster with the freq mod to make it more low end focused is my “other” bass tone now besides my Rat Tail. There’s nothing beating that snarl/growl and gating it can do. Even though I don’t have one on my board, the smallsound/bigsound BUZZZ is the best take on a Superfuzz I’ve ever had the pleasure of hearing or playing (I got to play one on Brian Hamilton’s demo board). That blew me away for sure when I played it! What can we expect from Fuzzrocious in the future? Hopefully years and years of creating pedals! If we can keep going in the direction we are moving, increase our production time/reduce wait time, and bring in enough income to make this our ONLY job, we would be content. We’ll be at Winter NAMM this year in an attempt to up our visibility and bring some new dealers into the fold. If any of you will be there, we’d LOVE to see you and hang. We can’t do Fuzzrocious without YOU (yes, you! This is like reading The Neverending Story…we’re talking to you, ‘Bastian), so bring your support and we’ll bring you rad pedals :). If the past is any indication of the future then everyone should be paying attention to Fuzzrocious in the coming years (especially on that reverb that seems to be in production). Huge thanks to Ryan and Shannon for answering questions and letting us see a glimpse of how they get their imaginative pedals from their home to ours. 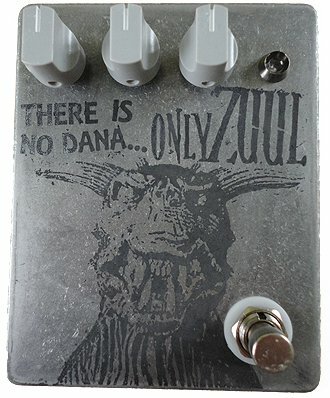 Check ‘em out at their site at http://www.fuzzrociouspedals.com/ and make sure you take a look at their Fuzzrocious Pedal Finder page as well!